Dental implants are a fairly recent, yet highly popular, a treatment designed to replace your missing teeth. Implants consist of titanium posts that are surgically placed into the jawbone, which are then used to support replacement crowns. Your jawbone fuses with the titanium as you heal, slowly turning the posts into stable supports. The crowns are affixed to the posts with small screws and are designed to be a permanent solution to tooth loss. Dental implants provide numerous benefits over the traditional treatments of bridges and dentures. Along with restoring the functions of your mouth and the appearance of your smile, implants are more comfortable and easier to care for. One of the biggest benefits that they have to offer, however, is the preservation of your jawbone. Neither bridges nor dentures can provide this benefit. At Michael Regan, DMD Family, Cosmetic & Implant Dentistry, we offer dental implants as a solution for tooth loss. They can be used to meet a variety of different needs, and we can help to determine if they are the ideal solution for you. Are You Missing At Least One Tooth? Dental implants replace missing teeth. The most basic qualifying factor that would make you eligible for dental implants is that you are missing at least one tooth. 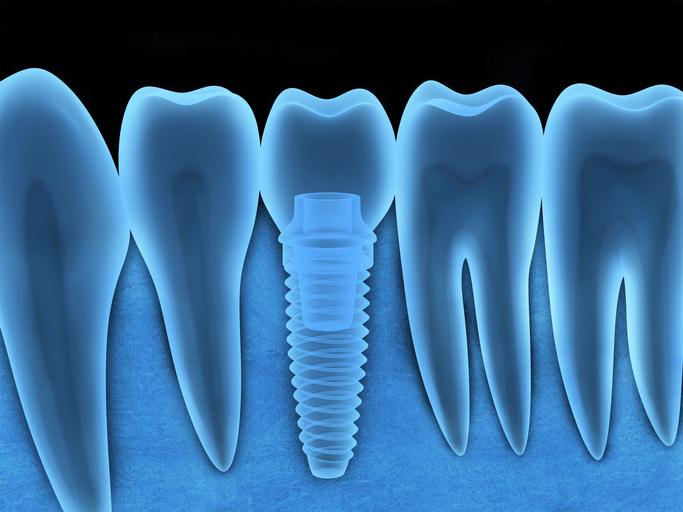 Implants are quite versatile and can be used to replace any number of missing teeth, whether it is one or several. In some cases, implants may also be discussed even though you are not yet missing any teeth. This is often done before undergoing a tooth extraction, so a plan is in place after the tooth is removed. Because implants require a surgical procedure, during which incisions are made in your gums and holes are drilled into the jawbone, you need to be in good overall health. Any outstanding issues will need to be treated before you can undergo surgery. Oral health issues such as gum disease and tooth decay, need to be addressed first. Chronic health conditions, such as hypertension or diabetes, need to be well managed. These factors help to prevent serious complications, such as infections or implant failure, both during your surgery as well as while you are healing. Even if you are deemed to be in good health during your consultation, but you come down with a cold or otherwise do not feel well, you should contact the office right away. Some illnesses require your surgery to be rescheduled. Smoking and other tobacco products contain harmful chemicals that can do significant damage to your body. This habit also interferes with the ability of your body to heal properly and promptly. Smoking restricts blood flow and lowers the oxygen level in your blood. Slowing your blood flow means that the delivery of nutrients essential for healing is slowed. This slows your ability heal, which greatly increases your likelihood of developing an infection. What Condition is Your Jaw In? The implant posts rely on the fusion of your jawbone for success. However, bone loss begins shortly after tooth loss. It occurs because the stimulation that the teeth once provided to the jaw is lost. Less stimulation means that fewer nutrients are sent to the jaw and surrounding area. The bone, as a result, begins to resorb and weaken. Over time it loses height, width, and mass. Without sufficient bone mass, the implants cannot properly integrate into the bone. They may be loose or even fall out. If we determine that you do not have enough bone mass in your jaw during your consultation, this does not mean that implants are not an option. There are still options that can make them possible. One such way is with a bone graft. If you are missing an entire arch of teeth, you may also be a candidate for the All-on-4® Treatment Concept. Dental implants can be a great option for an adult of any age. It does not matter if you are 30 or 80, you are never too old. They provide you with all the same benefits. Many older adults tend to think they are too old, but this is far from the truth. As long as you fit into other criteria to be an implant candidate, implants can give you back your quality of life no matter how old you are. It is possible to be too young, however. The jaw continues to develop into the late teens to the early 20s. If an implant is placed in an underdeveloped jaw, it can result in developmental issues. Children and teens who lose a permanent tooth will need to have the tooth replaced with another option. Implants can be revisited after the jaw is finished growing. Dental implants are a versatile treatment that can be used to fit some different tooth replacement needs. To find out if you are a candidate, call Michael Regan, DMD Family, Cosmetic & Implant Dentistry to schedule your consultation today at 503-654-8283.